Nancy is Mr Lynch's daughter. Bill is Mr Lynch's son. Mr Lynch is Nancy's and Bill's father. Mrs Lynch is Nancy's and Bill's mother. Nancy and Bill are Mr Lynch's children. Mr and Mrs Lynch are Nancy's parents. Laura is Bill's and Barbara's daughter. Lisa is Mr Lynch's granddaughter. Alan is Mr Lynch's grandson. Mr Lynch is Alan's grandfather. 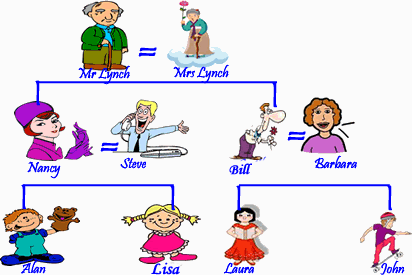 Mr and Mrs Lynch are Alan's grandparents. Alan, Lisa, Laura and John are Mr Lynch's grandchildren. Mrs Lynch is Alan's grandmother. Mr Lynch is is Steve's father-in-law. Mrs Lynch is Steve's mother in law. Barbara is Mr Lynch's daughter-in-law. Steve is Mr Lynch's son-in-law. Exercise on vocabulary related to people and family.